1. 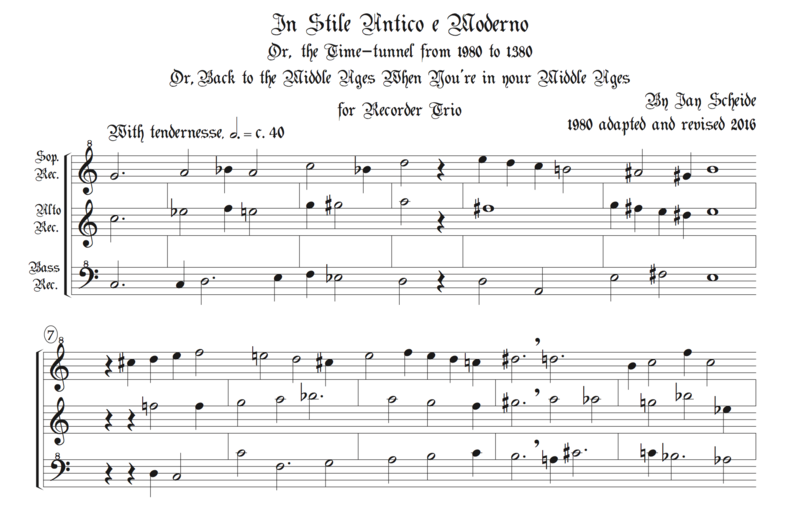 “In Stile Antico e Moderno” for SAB recorders. A short piece adapting the rhythmic and cadential procedures of the late 14th century (or so) to modern times. 2. “Canzona from Wawona,” for ATB recorders. A two-page piece of reasonably high difficulty, depending on choice of tempo (which is wide). 3. “It’s Seven-two Time,” for AAB recorders, five pages plus a set of parts, in a style owing a lot to Bartok & especially to Nancarrow. 4. “Wiskidy” for AAB recorders, the second alto doubling on Sopranino, with jazz inégal eighth notes, also not easy and including 3rd-octave F#’s, B’s & C’s for the altos. 5. A reprise of “In Stile Antico e Moderno,” but transposed down a fourth for alto, tenor, and great bass. If the ensemble lacks a great bass, the set could leave out this last piece (but could also leave out anything and have any order). Five scores and a set of parts for “7-2 Time”. For the other four numbers, each player does best to use full scores, either sharing them or printing them out individually.